Today is Anzac Day, Australia's most sacred religious holiday. All around the country, it is celebrated by the state, the military, the media, the schools – and not least of all by the Christian church. The theological mythology of Anzac Day is especially vivid if you look at some of the country's war memorials. 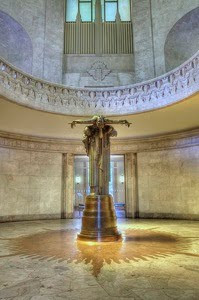 Sydney's Anzac War Memorial is designed like an ancient Greek temple. 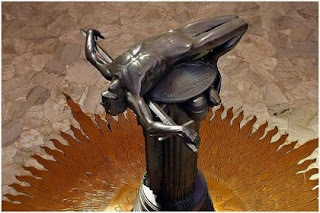 Inside it features Rayner Hoff's stunning 1934 bronze sculpture, Sacrifice, which depicts the body of a soldier held aloft on the altar of his shield, his arms draped across a sword in a posture of crucifixion, while the whole form rises like a phoenix from the flames below. It is a majestic image, a portrayal of worship, devotion and sacrifice. It's hard to imagine a more vivid representation of the cult of war that lies at the heart of the modern nation-state. 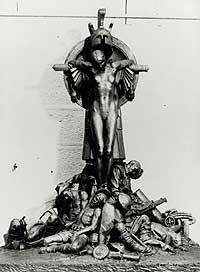 In this sculpture, the form of a young naked woman (symbolising Peace) is crucified atop a pile of corpses, limbs, weapons, and other wreckage of war. She is crucified on the weapons of Mars, the Roman god of war. The huge helmet of Mars gapes over her like some monstrous ravening mouth. From a distance, the whole hideous scene forms a traditional symbol of victory. Hoff himself described the sculpture like this: "Adolescent Peace is depicted crucified on the armaments of the ravisher, the war god, Mars. The Greek helmet animalistically gapes over the head of expiring Peace, the cuirass of the body armour hard and brutal in contrast to her lithe woman's body." It's a shame this piece is absent from the Anzac War Memorial. And it's a shame our churches have not reflected more on the religious symbolism of this holiday. In these devout celebrations, it's surely worth asking to whom these devotions are offered year after year – the Father of Jesus, or an insatiable pagan god of war? During the insightful sermon that I heard this morning, the preacher displayed various images of Australian war memorials. My two-year-old son was with me. When he saw the Sydney memorial (pictured above), he whispered in my ear: "Is it a church?" I replied, "Yes, sort of." Still looking at the image, he said, in his broken syntax: "Little bit scary church." I can't think of a more apt critique. You might also like to check out a new critique of Anzac Day by some of Australia's leading historians: What's Wrong With ANZAC? The Militarisation of Australian History (UNSW Press 2010).